Over the weekend I was talking with a tech-savvy friend who knew of my Apple fixation and he asked me, "Boy, you must really be torqued over the iPhone fiasco." Really. He said that. Now it is a "Fiasco." This comment got me wondering how exactly we have come to this point. The iPhone launch was a smashing success. 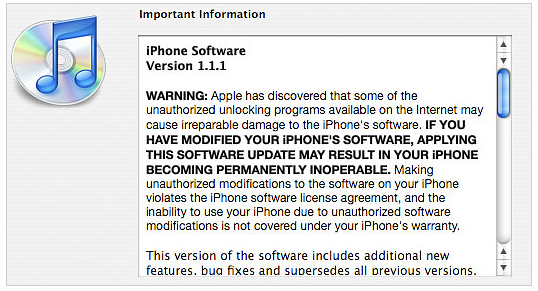 Apple wanted the phone locked but apparently didn't do a very good job of locking it with the initial release. They fixed that a few months later and told everyone words to the effect, "If you have tampered with it, we may (I interpreted that word to mean "will") brick your phone so don't do it." We had a few days to consider this statement and then 1.1.1 released. At that point Apple puts a specific dialogue on your screen. So after getting this second warning people who had hacked their phones for use by other carriers ended up with disabled phones. The word of art for this is "brick" used both as a noun and a verb. (i.e. those mean corporate types bricked my phone. 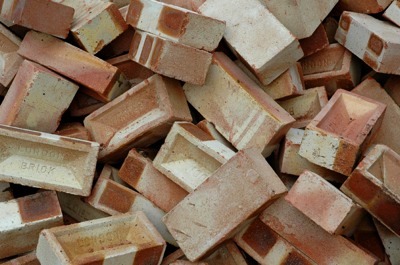 My phone is a brick.) I don't want to understate the popular use of the term "brick" because I think for a lot of folks that seems to be half the fun. Anyway .. I digress. Since the unlockers ignored the warning and their phones are disabled there is this perceived outrage over the terrible things Apple has done. Lawsuits are being filed, articles are written about Apple's PR nightmare, and tech friends are asking me about the "fiasco." I actually have two points about this hubbub. First, I don't lay blame at Apple's feet and second, I don't think this is as big of a deal as most people are making of it. Why should Apple have to spend time and resources making product upgrades for what was sold as a closed system device compatible with hacks and unlocks? They told the hacking gang that they shouldn't upgrade and they could have all kept their phones at 1.02 forever without having any troubles. I, frankly, would prefer that Apple spent their time making the system work better for the 90 percent of the owners that don't want to hack their phones. My second point relates to the perceived outrage over this event. There are some very vocal bloggers documenting this event as the turning point for Apple when they have abandoned the Mac Faithful. I don't really see it that way. I think Apple has always been a bit ruthless to their customers. One of the reasons it took me so long to buy a Mac was because when I initially became interested in them you had to buy the whole system (hardware, printers, floppy drives *no hard drives then*, and software) from Apple and it was really expensive. That was their business plan. It still is on some levels. With the iPhone, you are buying the product they want you to have in your hand. If you want something hackable, there are many smart phones out there that you can get. I had a few of them. On my Treo, I ran about 20 third party applications and yet it still wasn't as functional (or nearly as stable) as my iPhone. I'm comfortable keeping my smartphone experience in Apple's hands. If I wasn't, I wouldn't have bought the phone. I think a lot of people agree with me. As for the extent of this "fiasco", I think it really boils down to a group of perturbed geeks. For example, I was talking to my brother-in-law this weekend. The iPhone is his only Apple product and he loves it. He checks his fantasy football scores on it while sitting on the couch and couldn't be happier. He told how he updated his iPhone. I asked him if he heard about the problems with the update and he replied, "what problem?" I think for most of the iPhone users out there, this is a complete non-issue. I really don't have an axe to grind against the hacking community. I put installer.app on my phone but found nothing of much interest so I removed it. I really don't need a dorky game on my iPhone where I zap Microsoft Zunes. I sure hope that Apple eventually does open the phone up to some limited third party development but not at the cost of stability. I just think the attitude that because you've hacked your phone, you are entitled to some special consideration is ridiculous.